Trim excess fat from lamb. Cut part way between each rib. Mix mustard, salt and olive oil, and rub or paint the mixture on meat. Mix herbs, garlic and pepper. 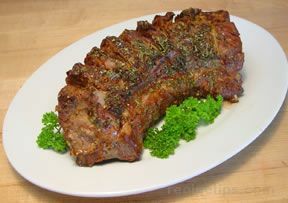 Sprinkle on the meaty side of the rack, letting some fall into the cuts between the ribs. Let stand while oven preheats to 400° F.
Let rest a few minutes before serving, to distribute juices. TIP: Put plates in turned-off oven to warm while meat rests.